Removal ProcedureDisconnect the negative battery cable. Refer toBattery Negative Cable Disconnection and Connection.Remove the power vacuum brake booster pump. 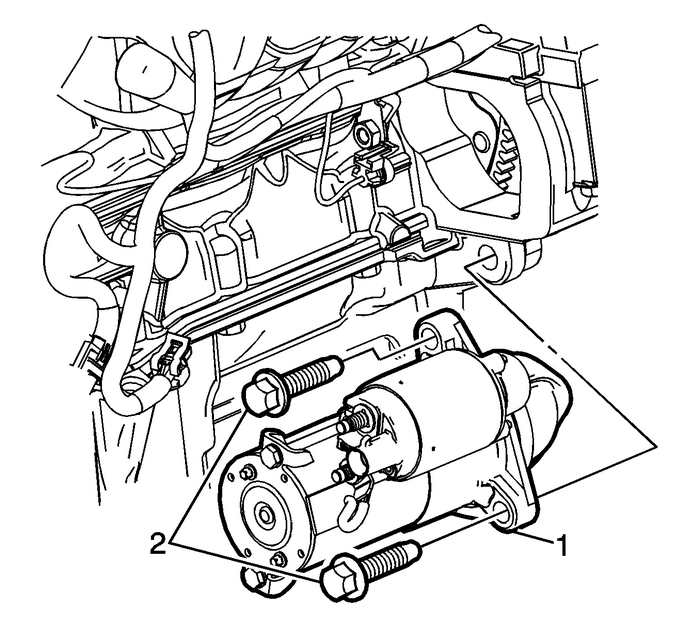 Refer toPower Brake Booster Pump ReplacementRaise and support the vehicle. Refer toLifting and Jacking the Vehicle. 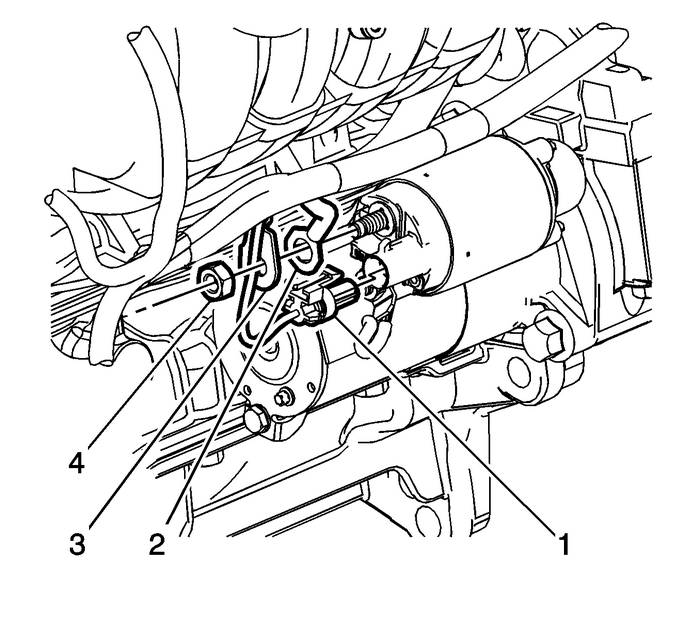 Disconnect the engine harness connector (1) from the starter.Remove the starter solenoid terminal nut (4).Remove the positive battery cable terminal (3) from the starter.Remove the starter solenoid wire terminal (2) from the starter. Position the starter (1) to the engine. Install the starter bolts (2) and tighten to 50-Y (37-lb-ft). Install the starter solenoid wire terminal (2) to the starter.Install the positive battery cable terminal (3) to the starter Ensure that the anti-rotationaltab is correctly located into the indexing slot.Install the starter solenoid terminal nut (4) and tighten to 10-Y (89-lb-in).Connect the engine harness connector (1) to the starter.Install the power vacuum brake booster pump. Refer toPower Brake Booster Pump ReplacementLower the vehicle.Connect the negative battery cable. Refer toBattery Negative Cable Disconnection and Connection.